Summer's here – and just in case Britain is able to bask in glorious sunshine for more than two consecutive days, here are some ways to keep your home cool. Your first instinct may be to throw money at the problem by installing air conditioning, but depending on the state of your home, Plentific.com suggests there could be several cheaper methods for keeping your home cool in the summer, some of which could benefit you all year round! Install insulation: Now, you might be suspicious of this one. Most of the time, we think of insulation as something that keeps our homes warm during winter. While it is true that insulation will stop heat from exiting your home, it can also help to keep it out. In a nutshell, insulation works by preventing the passage of heat, typically through walls, lofts or roofs. This capability will stop heat from entering into your home during summer, while also making it easier to maintain your property’s internal temperature. If you do not have insulation in your home, the best place to start will be with a loft insulation installation service. Most roofs are built with materials that absorb heat and then transfer it into the space below; in other words, your loft. This can heat up a house, but by insulating your loft you can ensure that the heat stays concentrated in your attic. Want to check if it’s working? Head up to your loft: it will be roasting! Tree and ivy planting: One of the best ways to stay cool this summer will be to give yourself some shade. Planting trees in your garden will provide this while also adding variety and beauty to your outdoor space. Plant a fruit tree, and you’ll also have a healthy crop to enjoy in a few years. The disadvantage of this option is that once you have planted a tree, it can take a while to pay off. An alternative is to grow a seasonal creeping plant, such as ivy, over a wooden trellis or pergola. Although this will require more maintenance, it can give you a simple, quick and attractive source of shade that you’ll be able to enjoy all summer long. Get cooking outside: While it may sound like a bit of a no-brainer, a lot of heat in the home is generated in the kitchen. Cooking over a hot stove in the middle of summer can quickly become unbearable, so why not take your cooking outside? Barbecuing is one of the best parts of summer: they make cooking outdoors a lot of fun, give you a chance to experience different tastes and also create plenty of opportunities for enjoying yourself with friends and family. While there are plenty of high end BBQ models, you could easily create a brick BBQ for yourself if you wanted something that will really impress. 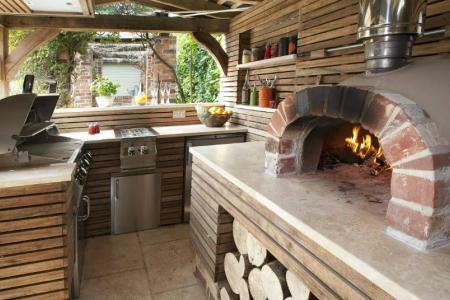 If you wanted to take your outdoor cooking a step further, why not speak to a landscape designer about creating an outdoor kitchen? These can be built with attached water taps, gas hobs and even built-in appliances! Paint it white: Have you ever been on holiday to the Mediterranean and wondered why everyone paints their homes white? There’s a very simple reason: white surfaces reflect heat! Still, while a full exterior wall painting job for your property might seem like a simple solution, it may not be completely practical, partly because you will struggle to gain planning permission for it! However, painting your roof, or even booking a reflective roof installation service, will deflect a great deal of heat from your property. You could also invest in white curtains and blinds to help reflect heat away from your windows. As luck would have it, painting your home white also has other advantages. White is a fairly neutral colour that holds a lot of universal appeal. This could, in turn, make your home much more appealing when you come to sell it. White walls can also help to make a room feel warm and open, and the last thing you want on a stuffy day is for a room to feel claustrophobic. Turn off appliances: In this hot weather, it may be tempting to put off doing chores for as long as possible. You might be glad to hear that you have an excuse: appliances can generate a great deal of heat. Appliances such as washing machines and dishwashers use a huge amount of hot water , and running them during the hottest parts of the day will raise the temperature in your home. You can avoid this by waiting until the evening and putting them on just before you head to bed. Cutting down on your appliance usage will also be a big help when it comes to cooling your home. If you have a habit of leaving electronic devices such as computers or televisions on, start switching them off when they are not in use. Instead of using your tumble drier, set clothes to dry on a line outside.